Place your tea into the clean distillery (or ferment barrel) and add 3,2 liter of boiling water. Now add 1,2kg sugar and stir for 2-3 minutes then leave to cool. \\[Pro]Once the liquid temperature has dropped to 55°C, add Pectolase enzyme and stir well. After 1-2 hours, top up to 7,2L with cold water, stir well for 2 minutes then wait till the liquid temperature has dropped below 40°C. The pH level should be adjusted to between 4 and 5. Now add the yeast and stir well. After 3 days fermentation, remove the tea using a straining bag (or equal) ensure you squeeze the straining bag tightly to release all fruit juice. Separately, dissolve another 1,6kg of sugar into 1,8 liters of hot water. Once dissolved, wait until the temperature drops below 30°C before adding into the fermenter. Top up with cold water to 10 liter level if needed. Ferment for 7-14 days, until fermentation stops, at as near 20°C liquid temperature as possible. [Pro] Discard the heavy sediment, add a clearing agent to liquid and leave for 2-3 days. Then siphon liquid again from heavy sediment, the crystal clear liquid can now be distilled. The fermented mash → remove the tea using a straining bag (or equal) ensure you squeeze the straining bag tightly to release all fruit juice. The filtered mash, ready to distill. 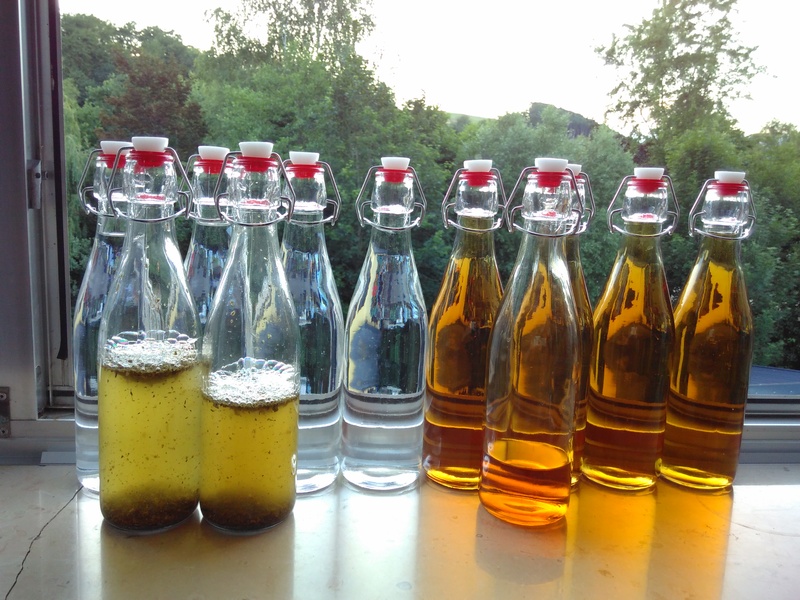 From left to the right: Mate Tea with Flora Power Booze, Mate Tea with Flora Power but in wood storage, Mate Tea with Flora Power recognized with Mate Tea. The booze is now dilute to 42,5%VOL. The finish bottle have 40% VOL. This project is outsourced to a member.